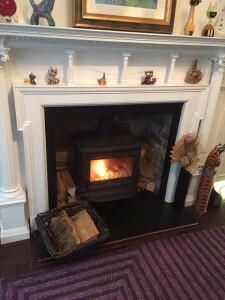 Posted December 1st, 2017 by Codastar & filed under Wood burning stoves. As we enter the winter with the dark evenings and first cold period now upon us our unconscious primeval instincts and urges start kicking into play and the romantic and comforting thoughts of sitting snuggled up in front of a warm homely fireplace start to circle in our minds. Ever asked yourself why this is? And furthermore in this modern day time how can we make it possible to give in to these urges and enjoy all the glory of a working fireplace but at the same time be responsible to the environment and be safe in the use of fire in our houses? Many believe (myself included) that the need and urge to have a controlled fire burning within our dwellings is something planted deep within our psyche that is inherent as a human being and has been ever since our cave man ancestors learned to rub two sticks together! It is an in built need for control and an evolutionary trait that has allowed us to stay warm and safe with illumination at home and the sanitation of our foods and fluids for millennia, it is the feeling of completeness and accomplishment to be sat in the knowledge that whilst the fire burns we are the masters on our environment. Modern times have made us more conscious and aware of our responsibilities to try to lower our carbon footprint and the amount of damage that we are doing to the planet and unfortunately as human beings we ALL leave our own footprint in one way or another from the cars we drive, planes we fly to the foods we eat and the energy we consume used to power our homes, streets and work places… this list is endless! When you think though about how many of these things are actually crucial to our survival and how many are just comfort things, I suggest that unless you have vacated your home and live in darkness in a tent in a field we are all guilty of some form of unnecessary harm to the environment! Things that are absolute necessities to survival however are food and water and warmth, and of course whilst we do have central heating that heats the entire household through our countless radiators this too comes at a very heavy price…. the cost of the worlds natural gas resources! Let’s also not forget that when burned and during combustion gas too produces poisonous fumes which are exhausted in to the atmosphere. 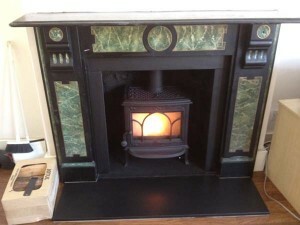 We of course do know that at present there is no other realistic way to offer to offer complete heating to our properties however it is also a fact that when spending a large portion of our time in one main living room area we can avoid undue waste of natural gas by heating an isolated single room area by way of a high efficiency, low emission stove and be content in the knowledge that when sourced from a responsible fuel supplier the wood that we burn is sustainable and furthermore practically carbon neutral! The cycle of each purposely planted and cultivated tree that is matured, felled and then dried allows the tree during its life to absorb the carbons from the air that will be created during its burning allows the whole process to be relatively green. So what should we do? Give in to our needs and urges and have a fire or be as responsible to the environment as we can? Fortunately we can do both, by utilising a measured approach to the timing and type of heating that we provide ourselves with and working the use of our central heating system to heat the whole house when required against the use of a our modern clean burning stoves to heat more localised areas within the house when needed we can find a balance to the amount of natural gas resources we use and the airborne pollution we create! Embers wishes everyone a warm and cosy winter and hope you can all enjoy the feeling of accomplishment that we get when we sit in front of our fireplaces.